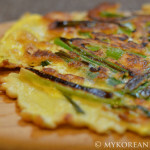 It’s been a while since I had pajeon (green onion pancake) since my California days, where I would eat it with my favorite traditional rice liquor called makgeolli. Sadly, it’s hard getting makgeolli here in the Midwest unless you make a stop by Chicago’s K-town, so I had to settle for a nice watered down can of beer. 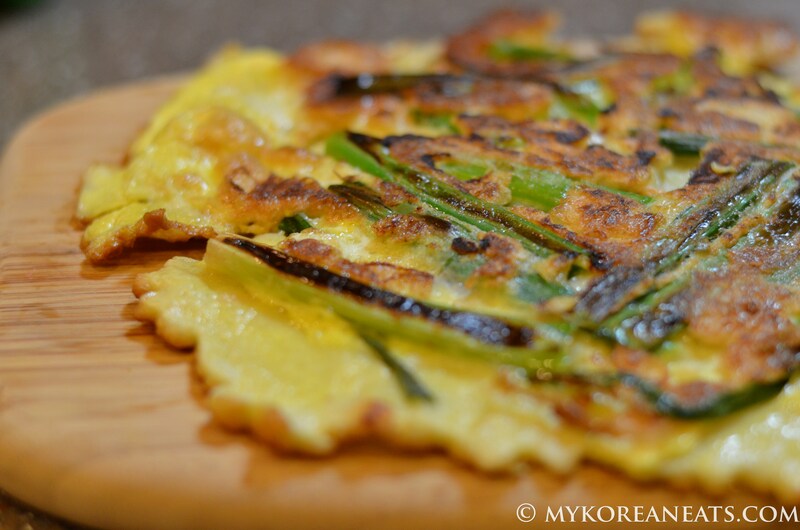 For the sake of adding to the recipe list, I decided to make myself haemul pajeon (seafood pancake) for a late night snack with some frozen seafood that I found in the local market. Although using fresh ingredients would be ideal, there isn’t much of a difference when it gets cooked into a pancake (at least to me). 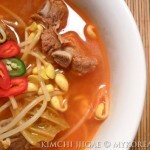 There are endless variations of this dish, which can be made by adding certain ingredients according to your liking. This dish, along with a slew of others, is referred to as anju (side dish for alcohol) which is very popular in Korean restaurants and bars. The recipe below also includes a basic dipping sauce that can be made in minutes. 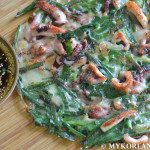 Original pajeon but added some shiitake mushrooms for a meatier texture. 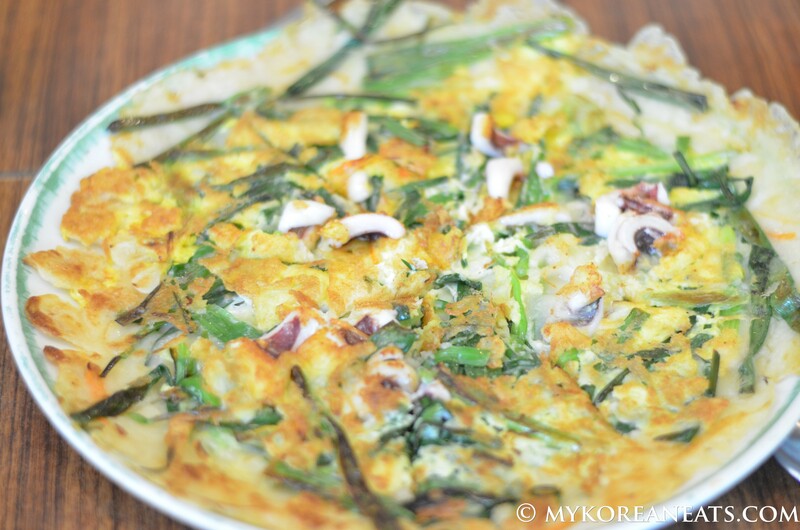 Haemul pajeon (seafood pancake) thoroughly enjoyed at a seaside restaurant on Jeju Island. 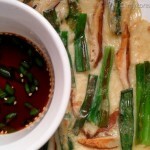 Classic pajeon with only scallions made at home. Mix all ingredients together in a mixing bowl until a thick batter mixture is created. It should be a similar thickness as regular pancakes. Heat a non-stick frying pan over medium-high heat and add a generous amount of olive oil. Pour half of the batter evenly over the pan. Cook for about 7, 8 minutes or until the bottom and its edges are browned. Carefully flip over and cook another 7, 8 minutes or until browned. Meanwhile, mix the ingredients for the dipping sauce and set aside. Depending on your preference, extra sugar may be added to create a sweeter dipping sauce. 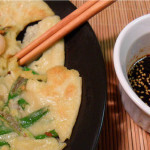 Transfer to serving plate whole or cut pancakes into desired pieces with the dipping sauce. *Purchasing fresh seafood is a good option for serious seafood lovers. However, it will require more time and energy cleaning them (and sometimes gutting them) so I advise buying ready-made frozen seafood carried by most grocery stores. 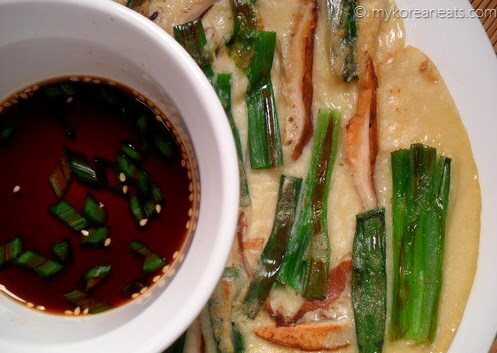 You can also go green/vegetarian by making the original pajeon that consists of only green onions/scallions. **One of the best pajeons I had was a seafood version served at a popular traditional bar in Apkujeong-dong, a posh district in Seoul. 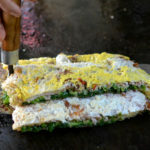 The cook/owner was kind enough to spill his secrets to this awesome dish: 1) don’t mix the seafood in the batter, but place seafood pieces on top of the batter once in the frying pan. 2) don’t mix the eggs in the batter, but add the whisked egg on top of the seafood pieces just before flipping over the pancake. 3) lastly, be generous with salt and pepper in the batter, it makes a world of difference.